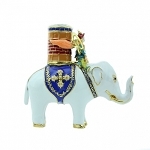 Displaying dragon turtle can give you good support as well as improve relationship and enhance good fortune. Dragon Turtle has the head of dragon and the body of turtle. The turtle symbolizes longevity. The dragon symbolizes career success and courage. Turtle stands for good health. 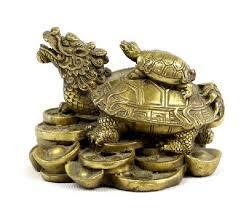 One little baby turtle on the back also represents good beginning whilst Chinese coins are the symbol of wealth. How to place it? You can display it almost everywhere you like (except bath room). 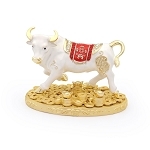 Displaying it near to where you sit can enhance your relationship luck. If you have arguing troubles, you can display it behind you. In this way, it can give you a good support. Find your "Tian Yi" position(for health) and Display it there for longevity. You can click the Find Your Gua Number to find out your "Tian Yi" position; Display it in Northeast for scholarship and further education. Dimension: The dimension of the dragon tortoise is approx. 5"(L) x 3 1/2"(W) x 4"(H).